Hi, I'm Eric Woodson, I help my clients Get Visible, Get Found and Get Paid! 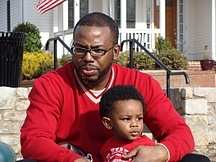 Eric Woodson provides small businesses the necessary tools to market their product or service. He utilizes an abundance of resources and gives 110% on every project. Having worked in this space for over 10 years he has been able to carefully analyze the evolution of marketing strategy. From working with a variety of small businesses, Eric Woodson understands the mechanics needed to launch, maintain and complete a winning marketing campaign. The most important element in successfully building your business is to reflect the authenticity of your brand. Once people believe in your product or service, they become your brand evangelists. They are the ones who then tell the story of your company. It is his job to creatively bring your story out and explain why your target demographic needs to know your brand. Marketing firm that specializes in solutions for small businesses with a focus on search engine optimization, social media management, mobile marketing, web design & development. Consults with small business owners on how to use the latest technology to increase sales. Designs & maintains client websites, SEO strategies, social media accounts, and mobile marketing campaigns. Teaches various internet marketing classes at local libraries throughout the Fulton County Library system. Manages the development of identity packages, logos, and other marketing & sales materials. Negotiated rental and lease agreements; supervised capital improvements, repairs and revisions of 102 properties in 4 states over a 5 year period. Appointed, oversaw and trained team of 30, including construction, maintenance, security and clerical workforce. Utilized various marketing tools including the internet, mobile marketing, social media, and classifieds to build database of buyers and renters. Served as the Investment Appraiser, traveling to different property sites, arranging financial analyses and feasibility studies of potential property acquisitions. Weekly entertainment newsletter focusing on events, news, fashion, sports, entertainment, and travel geared toward an urban audience. Over the course of 5 years built email database to nearly 500,000 subscribers.